It's the end of February and I'm gardening on the Canadian prairies! Okay, so I'm not really gardening like you're probably thinking with the soil, worms, bugs, etc. And, I'd have to dig under 3' of snow to even find my garden. No, I'm not even window gardening as in starting slips, plants and seeds for an early start. My garden uses water, but no soil, and takes 1 week from planting to harvest. Can you guess? 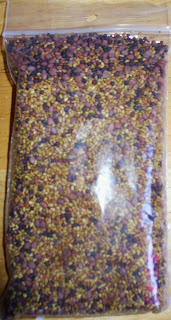 Here's a 2"x4" bag of the seeds. I'm not sure exactly what seeds are in this selection, but it's called the Salad and Sandwich Booster. 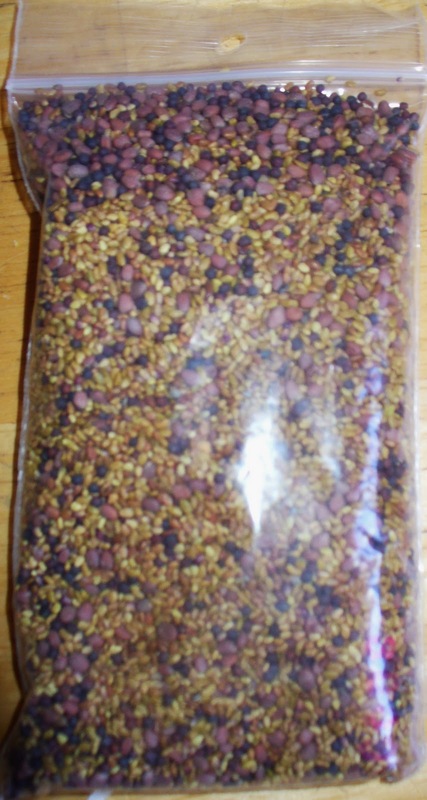 A crisp, spicy mix, it's perfect for salads, sandwiches, hot dogs and hamburgers. And now I'm sure everyone is jumping up and down saying 'Sprouts'! And of course, you'd be right. This all started last year when I began eating healthier and denounced all unhealthy snacks. Once I'd cleared the extra fats and sugars from my body, I lost all the cravings for them. And I began to lose weight. To keep on track, I used the Apple App Lose It which Inky Debra E Marvin blogged about recently. This healthy eating style worked so well, I'd lost 53 lbs between Mar and November. I looked better and felt better. But there was one big negative . . . I was always cold. I could not stay warm and it bugged me! I'd lie in bed at night with hubby spooned behind me and his arms around me but wherever his skin wasn't touching me was ice cold. Brrrr. Since I've been under a doctor's supervision for several years now due to High Blood Pressure, she knew exactly what was happening. Although my HBP and cholesterol was back to normal, my doctor said my muscles were starving. She said I needed protein. But I've been eating oodles of fruits, vegetables, and dairy. She said it wasn't enough. So at the end of Nov, I raised my calorie count and allowed myself more protein rich meats, fish and dairy. I was still cold. When I went back to my doctor in January, she said I needed plant protein. I said I eat lots of vegetables. She explained she meant legume protein. I went home thinking... maple brown beans? I can do that. But then it dawned on me out of the blue one day - okay I admit, it was probably God giving me a talking to - that the doctor was talking about sprouts! I even had 2 sprouting kits at home that I hadn't used in years. So I dug out my sprouting seeds... yes, that bag of seeds in the photo is over 10 yrs old ... and I began to sprout my own protein. 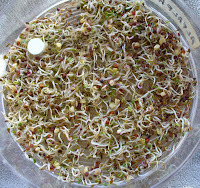 I'll show you how I did it and then let you know how you can do it if you don't have a sprouting kit. 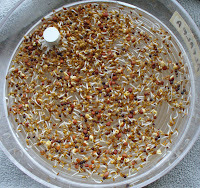 Feb 21st - I used my small 6" wide sprouting kit which I picked up for a couple bucks at a Value Village (think Goodwill). It doesn't have a lid, but I can make do. What you see here is 1 tsp of mixed seeds. The first step is to fill the top part half full of warm water. The water seeps down through the white cap-thingy you see in the photo above this and drains down to the 2nd level. In reality, that 2nd level could have sprouts I'm already harvesting for an ever-ready cycle. I left my first batch uncovered, but some seeds need darkness to germinate and the harvest was only 50% of what it could have been. So for this batch, I covered them with a towel and left it like that. 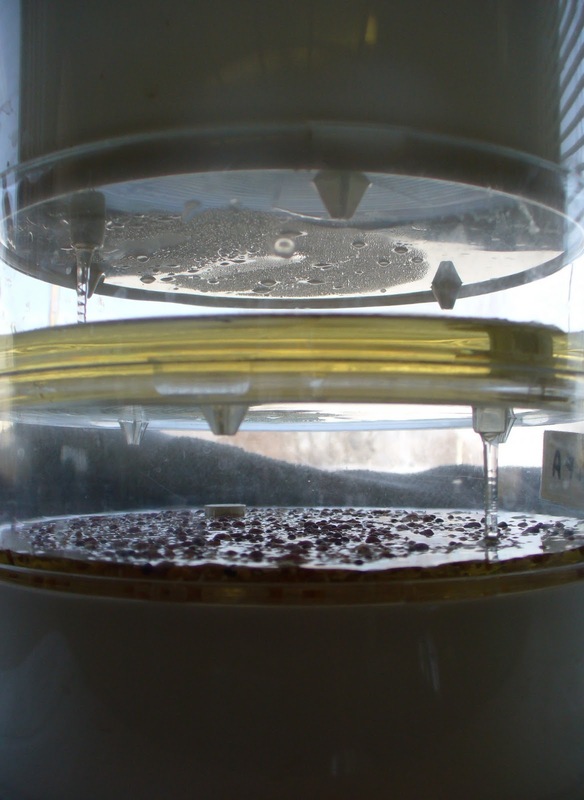 Feb 22 - I dumped the water out of the bottom level and added fresh water to the top. I didn't take a photo of the seeds though because there really wasn't that much action after only 24 hrs. Feb 23 - Some of the seeds are beginning to sprout. It's now a daily habit at noon to dump the bottom level and add fresh to the top, then cover with the towel. Feb 24 - Same routine. Feb 25 - Same routine except some of the roots have a bit of fuzz so I'm leaving the towel off. Feb 26 - Day 5 of the routine and you can see the colour change as the green seed leaves open. 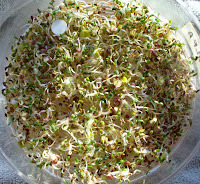 Feb 27 - The sprouts are ready for harvest. 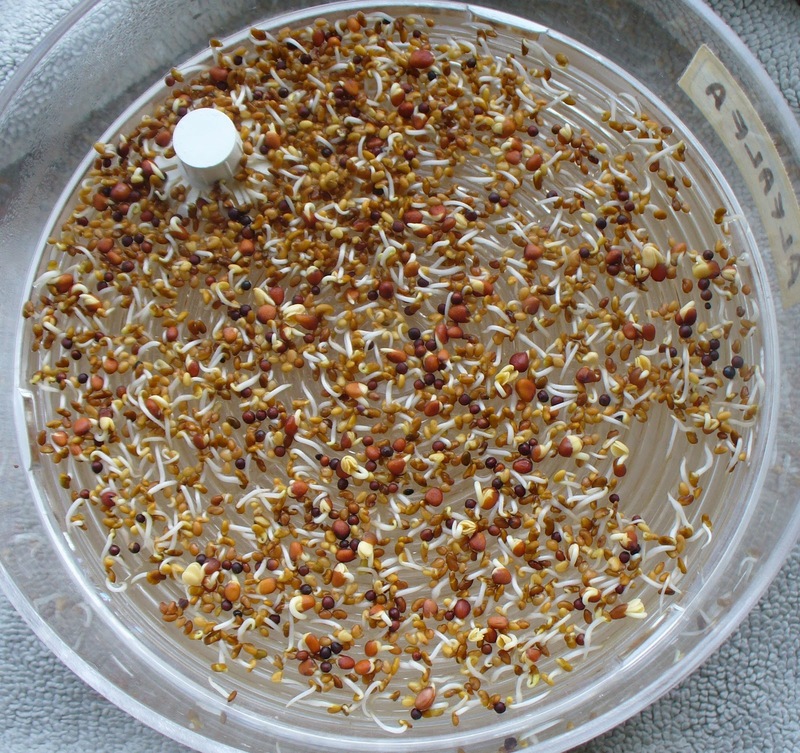 If you compare this photo with the one on Feb 21, you can see how that 1 tsp of seeds have 'sprouted' to fill the container. And here's the finished product. Fresh sprouts, 6 days from first watering to harvest. Healthy and easy to grow. 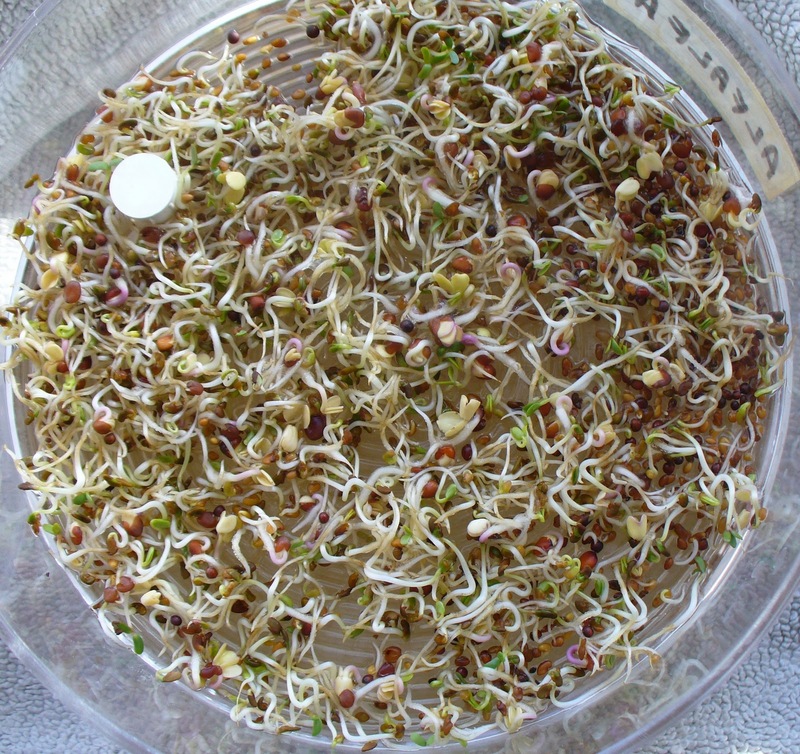 Sprouting seeds can be bought at health food stores. I bought the seeds I'm using now from amongst packages of spring garden seeds all those years ago. And while checking on-line sources for this post, I was surprised to find them for sale at 1 lb for $13 at amazon of all places. Of course a pound is a lot of seed, but if you're keen on healthy eating it's a better deal than the 8 oz for $9.45 at another on-line site. 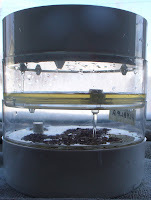 - Put 1 or 2 tbsp of seeds in a wide mouth jar. 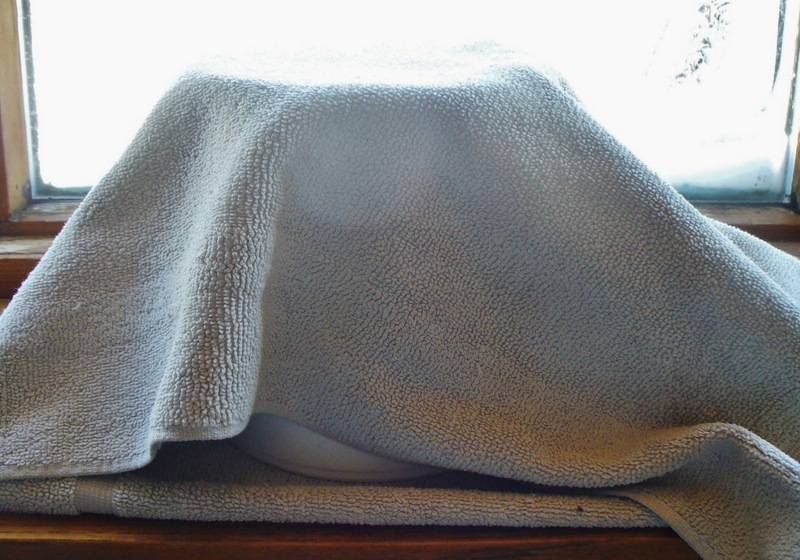 - Cover with cheesecloth and keep in place with an elastic band. - Turn over and strain. - Day 2 - Drain, rinse and drain twice a day. - Day 3-5 - Drain, rinse and drain twice daily until seeds are sprouted. *If you notice in the above instructions, they've left the seeds to soak for the first half day only. 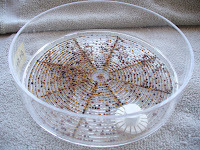 This will certainly increase the sprouting time. So there you go. Fresh greens grown in Feb on the Canadian prairies. It can't get any better than that. *Want to win some seeds? I will pick three names from all those commenting on this post before Thursday, March 3rd at midnight to receive 1 tbsp of the mixed seeds in this post. Yes, they're old, but they've been properly stored and are still very viable. 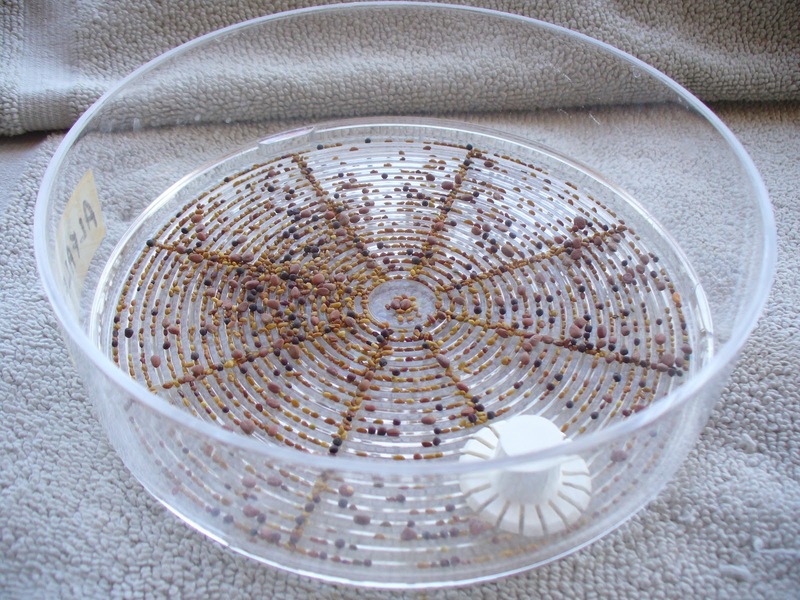 One tbsp is enough seed to see if you like this method of growing. You could use 1 tsp at a time like I do, or you could use the full tbsp at once. You must include your email address in your comment to be included in this draw and remember to us (dot) and (at) etc so the web spiders don't find you. *Open to everyone but dependent upon postal and custom regulations. 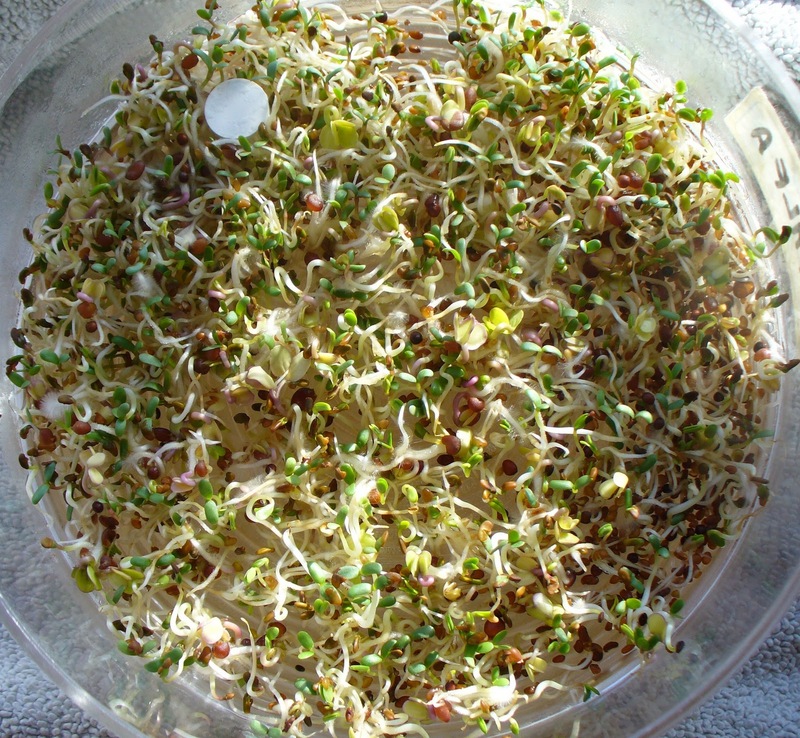 Have you ever tried sprouting your own seeds to add to your salad? Or do you buy them at your local grocery or health food store? Or perhaps you've never tried them? Anita Mae Draper is retired from the Canadian Armed Forces and lives on the prairie of southeast Saskatchewan, Canada with her hubby of 30 plus years and 2 of their 4 kids. 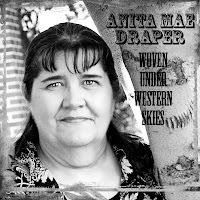 In 2005, Anita Mae decided to return to writing and make it a priority in her life. She writes western romances set on the prairies of Saskatchewan, North Dakota, Montana and Wyoming. Her flawed characters don’t travel an easy path of courtship. And if they don’t know about God at the beginning of the book, they will by the end. Anita Mae has finaled in the 2009 Linda Howard Award of Excellence contest in the Inspirational category, the 2008 Gateway to the Best in the Contemporary Series category, and the 2008 Golden Gateway in the Long Contemporary category. A pathological picture taker, Anita Mae usually has a photo or more on her personal blog as well as the Inkwell Inspirations blog she shares with several women of faith. okay, so what kind of seeds are they? And how/when do you eat the sprouts? I've always been a "hold the sprouts" sort of girl, when they are listed as a sandwich item. I eat hummus everyday and I eat peanut butter every day, and I've tried to count up those legume calories plus my yogurt proteins to see if I was getting enough. But I never thought about the breaking down the seed and dairy proteins. And congratulations on your continuing weight loss. I fell off the no sugar/no white flour wagon numerous times over the holidays but just got back a couple weeks ago. it's a slippery bad carb slope, eh? MONDAY! A perfect day to start over and probably the reason the Lose It program starts a new week on Mondays, as well. Yes, I'm back on Lose It. Thanks for some food for thought! 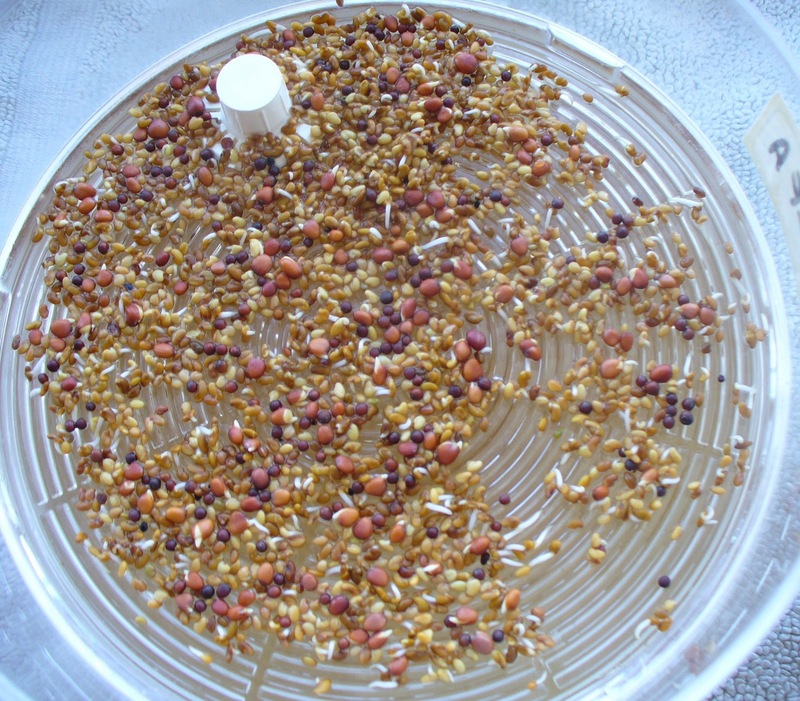 'You can sprout seeds, beans, grains and nuts. Some of the most popular varieties are alfalfa, broccoli, red clover, radish, mung beans, lentils, garbanzo beans and peas. Having eaten a lot of sprouts in my life as well as having owned a greenhouse, I can tell you that my spicy mixture - yes, it really has zip to it - contains radish and broccoli. The rest are clover and alfalfa. I personally wouldn't recommend putting the bigger pea and lentil seeds together as they would germinate a day or two later than the smaller ones. As for falling off the wagon, that was the result of adding more calories to my diet in Nov/Dec/Jan. I don't completely go no fats/no sugars, and I still eat bread except that our breads are whole grains - either flax, ancient grains, or 9-grains. Between the tasty bread and spicy sprouts, a chicken sandwich never tasted so good at home. I didn't even know how sprouts were grown. Very interesting, Anita Mae. I might like them if they had a zip to them. I think the problem I've had with sprouts in the past is that they were bland... and stringy. Like eating a mouthful of hair. But if they actually had flavor that'd be a whole different ball game! Lisa, the ones you're describing sound like the alfalfa sprouts. Yes, they are bland. And the clover ones are sweet. But the brassicas such as the radishes and broccoli have quite a bite to them which is why I like this mixture. As for tall and spindly, once sprouted, they grow about an inch a day. That's why I only plant a tsp at a time. My 'batch' will last all week until the next batch is ready. If it was the straight alfalfa or clover, I'd finish it off in a day or two because I'd be trying to capture the taste. Thanks for mentioning that, Lisa. So tell me more about sprouts as pertain to protein. my mom went through different health fad phases when i was a child and i remember sprouting sprouts - just the alfalfa type though. i've always liked them on salads. i think i need to check into that since i really want to lose weight and i'm not making ANY progress right now. i'm also curious about sprouting the peas and garbonzo beans - because those are my favorites. i used to make my own hummus, but then i burned out the motor on my food processor and haven't bought a new one yet. i should. i know i'd begin eating healthier. you are an inspiration, Lady! Thanks, DebH. :) The larger the seed, the longer it will take to sprout, which is where soaking them for the first half day will really help. And good choices. Your peas and garbanzo beans/chickpeas are the highest sources of plant protein. Thanks for the visit, Deb. Remember, if you want in on the draw, you need to leave your email address so we know who to throw in the hat. Virtually speaking of course. Ha! I'm interested so I'll look into this some more. when I do the no sugar/no white flour thing I still eat whole grain 100% whole grain. I don't feel well if I don't get those kind of carbs. I've baked my own bread in the past so I can control the type of sugar (food) for the yeast. I'd like to compare the protein in rolled oats to the protein in sprouts. Wouldn't the oats protein be the same? Rolled oats are processed and every time you process, you lose nutrients. Considering that that sprouts have more to start with, you're already losing. - why people who consume large amounts of calcium suffer bone loss? - why people who consume large amounts of bran end up with irritable bowel syndrome? - why people with who eat healthy and consume healthy grains persist in having acne problems? And soaking adds to the enzymatic (or stretching) force. However, you can only sprout hulless oats. The rest have been mechanically processed and between the crushing, light and heat, they are no longer viable. Deb, you'll get some benefit from your rolled oats, but if eat them on a regular basis, soak them overnight on the counter first. Anita, you may have just changed my life! I'm always cold -- always -- and I tend to say no to sprouts in restaurants because of issues with them and E Coli. But if I grew my own, I wouldn't have that problem, would I? If I weren't an inky, I'd leave my email and shout, pick me! Oh, I love hummus too. We eat a lot of it! Very interesting, Anita. So am I understanding correctly that you can grow sprouts from nuts and beans? Or were you just listing the nut/bean protien content? Congrats on the weight loss. I have a hard time going without bread and sugar, but I've been able to slowly cut back. I do eat a lot of nuts and peanut butter, but I'm cold all the time, so need to check my protein amount. Love your pic and tag line! Susie - one thing to consider is that not all seeds are the same. Like fruits and veggies, some are organic and some aren't. The seeds I use are organic. They haven't been sprayed with a pesticide, fungicide, rodenticide or sprouting deterrant (yes, you read that right). When you see pkts of garden seed in the store, unless it says 'organic' chances are it's not good for you to sprout. Examples of this are garlic bulbs and potatoes. You buy them in your grocery store/supermarket, but you can't/shouldn't plant them. They had 'stuff' done to them so they won't grow while in transit and storage. Same as with sprouting seeds. 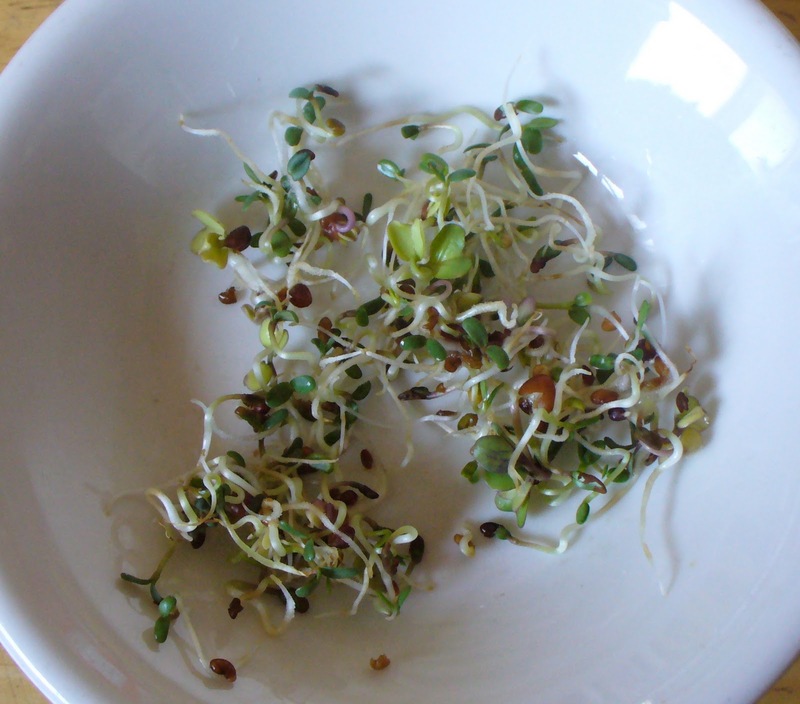 You need to buy real 'organic' sprouting seeds. As for the E.coli - from what I understand, that comes from the soil, the water and the hands of people handling it. If you grow them hydroponically - water only - like in my post, use purified water, and wash your hands thoroughly before touching them, then E.coli won't be an issue. Wait - you have to ensure your sprouting container is clean, too. duh. Hoping it works for you, Susie. Suzie - beans are among the healthiest sprouts. They just take a day or two longer because of their size and harder coating. Yes, nuts (peeled/hulled) can also be sprouted but again, because of their density, it will take even longer and they aren't as beneficial as the peas and beans. I can't go completely without sugar or I develop severe headaches. But I limit myself to one teaspoon per cup of coffee and only 2-4 coffees a day. That way, my body gets the sugar it needs and I don't get headachy or woozy. Thanks for mentioning my pic, Suzie. Thanks so much for sharing these tips. I've been working on being a healthier eater and this gives me something else to think about. Congrats on your weight loss and healthier life. Those look like some great sprouts Anita Mae. I've been having great luck with sprouting green lentils from our pantry and can't believe how tasty the are. My wife cooks with lentils all the time, but never thought I'd find myself eating them raw! Now that my girls are gone, I share the house with 3 potato chip and pop people who munch and slurp behind me while I work. And yes, I'm tempted, but I'm more tempted not to give in, you know? I wish you all the best as you explore a healthy lifestyle. If you need a weight loss buddy, let me know and we can encourage each other as we go. But then, I don't like cooked spinach, either. Too limp. I love raw spinach when it's young, though. Healthier, too. Thank you for giving your url. Your blog about life in Turkey is fascinating. I sure hope there won't be any rules to stop me from sending you the seeds if you win because I think that will be cool. Good pics of your lentil sprouts. Very tasty looking. How do they taste? Bland, spicy? In between? I've never tried to sprout lentils, although we grow a lot of them here on the prairies. I usually just use them in a lentil and sausage dish. I have some seeds around here somewhere.... will they still sprout after a few years??? Eeks!!! I may try anyway! Thanks for the reminder, Anita! Now, where did I put them? Cheryl, it depends on what they are and how they've been stored. Most seeds are good for several years, although flower seeds don't last as long as vegetable seeds. If they've been stored in a plastic bag or tin in a cool, dark place, they'll store for many years. That's how they're stored at the seed banks around the world. They're even finding some viable seed in ancient Egyptian tombs that were sealed and not opened for a thousand years. Okay, now I'm craving sprouts. My mom did this during her health food craze, at which time I was required to chew and swallow all apple seeds and eat an apricot pit every day to get some sort of obscure vitamin.